I want to write a blog post to follow up my pre-conference post. I don’t want some sort of self congratulatory ramble but I thought it might be helpful to write about how I prepared the talk and to reflect on that. In essence I did almost everything different to what I might usually do when preparing a presentation and that meant it felt very different to anything I’d done before. But I also want to thank everyone who helped me along the way, but in particular to acknowledge the help and support from my co-author, friend and research partner, Chris Morrison. When we are not mucking about playing copyright games or showing off about who knows the most about Star Wars (it’s me by the way), we’ve had some pretty good chats about education, copyright and the role of technology over the last year or so, and many of the ideas from the talk feel like they came together, in hopefully what wasn’t a large unattributed mush, last Thursday. For those who haven’t seen it, the recording is on You Tube. According to my lovely brother, my greatest critic, I sound rather nervous at the start and he still isn’t sure if he can or can’t copy an image off the internet. I promise if you watch the recording, I do get warmed up, and in answer to Dan’s question, it depends! I got the invitation to present at ALT-C on 24th March, it was over Easter and shortly after meeting Nic Whitton and Alex Moseley at LILAC in Dublin. Well that was a memorable conference if only for learning how many straws one person could put up their nose and why lilac coloured cocktails are a bad idea. I had spent a fair amount of time with them both as they gave a joint keynote and were at the conference all 3 days. But the invite left me speechless, just for a moment and petrified! From that moment on it was on my mind as I wanted to do a really good job. I was at the time putting the finishing touches to the proofs of Chris and my recent book, Copyright and E-learning, and so it immediately seemed this should be the topic for the talk, but in the first set of notes I sketched out I had an idea that I wanted to talk about information literacy and social justice and somehow link that to copyright. I started off with doodles of all the random ideas I might include. I recall spending an afternoon in the pub waffling on to a techy friend about these ideas and not getting too far. However one of the first things I did was to buy myself a beautiful notebook to write down all these ideas as they were occurring to me. I then decided to started reading up on how to give a great speech. The video by Chris Anderson, founder of Ted Talks was really helpful here. Next up I had an opportunity to try out some ideas as Chris and I were invited, on the back of the book, to give a keynote at the DIT E-learning summer school in June. It was a great opportunity to plan a talk, which was largely based on key ideas from the book. However this dry run also gave me plenty of ideas of how not to approach the ALT keynote. Firstly I wanted a really simple clear message and to focus on big ideas rather than detail. I also concluded that as this would be my keynote, I really needed to own it and make it mine. Again I read up on how you do this and the main idea seemed to be about making it ‘your story.’ That meant putting something of myself into it, which upped the stakes and started to make me more scared. Two events in July gave me further ideas of how to approach the talk. The first was our book launch, where I decided to write a speech, largely to avoid forgetting to thank everyone! 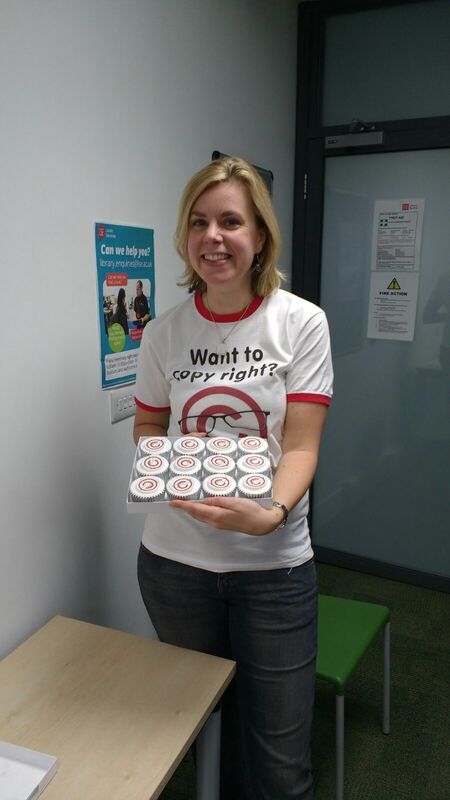 And then a LIS-copyseek event where I agreed to say a few words about Laurence Bebbington, who was a member of the UUK Copyright Working Group and sadly passed away over the summer. Again I decided to write a speech as I wanted to get my words right. The whole writing a speech thing helped enormously in those two occasions so seemed the way to go. Some of you may have read my earlier blog post on my writing retreat at Wolfson College. This was where I wrote most of the keynote as a script. Chris suggested I forget entirely about visuals until the end but during the writing process ideas of useful images kept occurring to me, so I did start making a few slides. But essentially by mid August I had a rough outline speech and I refined it over the next few weeks largely by reading it to a trusted few. This led to some new ideas being added but mainly I was trying to cut it down and learn it and check it made sense. Only then did I finish my slides, which were images largely to illustrate points I was making. And then I practiced reading it many times, thanks to Tim, my mum, my step-dad and Chris for listening to it until they were probably bored senseless. I wanted to try to convey something of me and my passion for information literacy and copyright education. But that did leave me feeling vulnerable and finding the Ted Talk by Brene Brown was another key moment for me. Largely because empathy was already a big theme in the talk and she really illuminated what this means. However, finding this talk was in many ways luck, as I had recently subscribed to the RSA talks on You Tube and stumbled across Brene Brown here. Similarly, the other book that influenced a lot of my thinking, Rethinking Copyright by Ronan Deazley, I borrowed from LSE Library, partly because I thought it might help me mug up on the history of copyright, which it did, but it was his ideas around copyright as a human right and the curtailment of the public domain that really chimed with me. So looking back now, I don’t think any presentation will ever be quite so difficult to prepare, or take so long. I feel I have an approach that works if someone ever asks me to keynote again. I learnt to trust my instinct with big ideas and bringing in my own stories. No I don’t think the talk was perfect, but I’ve watched about 10 minutes and I liked it. I think the audience did too judging by the tweets on the day and the hugs I got at the end. My proudest moment was probably when Lorna Campbell said “I never knew copyright could be so emotional’ during the questions, oh and my colleague Sonja drew a beautiful picture of me and said I nearly made her cry. As I said in my talk, I didn’t get there on my own. I had a lot of help, support and people who believed in me. Many of the ideas I talked about feature in Chris and my book and he helped me enormously. But many of my friends and colleagues gave me help and support and I know that is a privilege and one I want to use to help others. Fear can hold us back from doing things in life, things that are new, things that involve risk, things that might expose us to criticism, but as Brene Brown says, if we clad our heart in iron it means we don’t build trust and connections. And sometime we just have to take a leap of faith. So I say bring on the next challenge! I’m ready! This entry was posted in Conferences & Presentations, copyright. Bookmark the permalink. Thanks Trish for reading it and for your comment.Sometimes it is a lot easier to say what you think when you write it down. And we never get five minutes to talk when I see you at a family do. I think we are a family that loves talking, but sometimes we don’t spend enough time listening! I’m the same. Ordinary talks, no problem, but Keynotes terrify me. Yes but I feel I can do this again now Charles, so bring on the next one I say. Plus I have discovered that you can trick your brain when you feel fear to believe it is excitement!